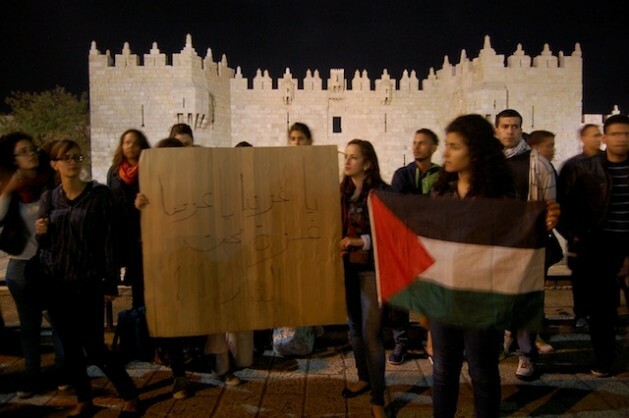 A demonstration in Jerusalem against Israeli aggression. Credit: Jillian Kestler-D’Amours/IPS. JERUSALEM, Nov 15 2012 (IPS) - As Israeli bombing of the Gaza Strip enters its second day, Palestinians fear that this is only the beginning of another widespread Israeli offensive into the besieged Palestinian territory that would leave them nowhere to hide. “People are very worried about the coming days. This morning we heard air strikes and up until now, the situation is very tense,” Palestinian Centre for Human Rights (PCHR) deputy director Jaber Wichah told IPS over the phone from his home near Gaza City Thursday morning. On Wednesday afternoon, Israel killed Ahmad Jabari, head of Hamas’s military wing, as Jabari was in his car in central Gaza City. The Israeli army spokesperson’s office stated that Jabari was the “first target” of a military campaign that aimed to deter Palestinian fighters from firing rockets towards cities in southern Israel. In response, Hamas stated that Jabari’s killing would “open the gates of hell” for Israel. Within the first 24 hours of the large-scale Israeli bombardment, 13 Palestinians were reported killed, including three children and a pregnant woman. In turn, Israeli media reported that Palestinian militants fired more than 100 rockets at Israel, and that three Israelis were killed when a rocket hit a home in Kiryat Malachi town 25 km north of Gaza. “Our doctors and medical staff are highly experienced and they are ready to cope with the situation, but the problem is the lack of medicine,” said Dr. Hassan Khalaf, deputy minister of health in Gaza. He said that Gazan hospitals are running with less than 60 percent of the essential drugs they need. Dr. Khalaf told IPS that while the situation was calm at mid-day Thursday, so far more than 100 Palestinians from all over Gaza have been injured by Israeli fire. He said Egyptian authorities are prepared to facilitate transfer of injured Palestinians through the Rafah border for treatment. “This aggression against civilians by the Israelis should stop and all the world should stand against the Israeli aggression,” Dr. Khalaf added. While Israel justifies its military operations as a response to Hamas rocket fire on civilians in Israel, a factsheet released by the Institute for Middle East Understanding (IMEU) paints a different timeline of events. The latest flare-up of violence began on Nov. 8, when Israeli soldiers invaded the Gaza Strip, and in an exchange of gunfire with Palestinian fighters killed a 12-year-old Palestinian boy. Palestinian militants later blew up a tunnel along the Israeli-Palestinian border, and fired an anti-tank missile at an Israeli army patrol jeep, injuring Israeli soldiers. Israel then renewed bombings of the Palestinian enclave, while Palestinian fighters launched rockets at southern Israeli towns and cities. In the last week, five Palestinian civilians – including three children – were killed and over 50 others were injured in Israeli attacks. Israel’s killing of Hamas military chief Ahmad Jabari on Wednesday broke a ceasefire that had been reached between both sides on Nov. 12. “We will not accept a situation in which Israeli citizens are threatened by the terror of rockets. No country would accept this; Israel will not accept it,” Israeli Prime Minister Benjamin Netanyahu told a press conference Wednesday evening. Israel has dubbed its strikes on Gaza ‘Operation Pillar of Defence’. “If need be, the Israeli army is prepared to expand the operation,” Netanyahu said, hinting at a potential military ground invasion. Israel’s breaking of the ceasefire is reminiscent of what happened in 2008, when Israel launched a cross-border raid on Hamas fighters in Gaza, prompting a barrage of rocket fire onto southern Israel. This provided the Israeli military with a reason to launch a large-scale ground operation into the Gaza Strip; known as ‘Operation Cast Lead’, the three-week Israeli military offensive left more than 1,400 Palestinians dead, including at least 300 children. The Israeli operation was widely condemned. But Israel’s ability to launch attacks freely onto the Gaza Strip may differ from four years ago, largely due to the recent uprisings throughout the Middle East and the altered political situation in the region. On Wednesday night Egypt – which is now led by President Mohammad Morsi of the Muslim Brotherhood – recalled its ambassador to Israel over the air strikes. The timing of violence between Israel and Gaza has also raised questions about political motives, as Israeli politicians are in the midst of an election campaign. “It is an objective fact that it is serving the purposes of (Israeli PM) Netanyahu very well: to turn away the attention and make the public agenda focused on military issues, and not on social issues,” Adam Keller, an Israeli activist and spokesperson of Gush Shalom, an Israeli peace movement, told IPS. Just read three of your stories. Nice pro-Palestinian propoganda.